As if we're going to win. To weight it up, if are victorious we'll be delighted, a win over our rivals. If it's 5-0 even better. But, BUT, if Palace win, they will have the cliched bragging rights pretty much forever - the first team to win at Falmer. 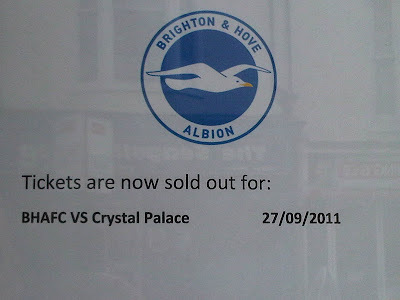 Those enamoured hacks would certainly give Palace a few lines should they break that sacred duck. of course, this could be undone in the future by Albion winning the first game at Palace's new stadium but I'll leave the comedy up to Kevin. Kevin, you numpty, we've been putting up with Palace fans' gloating about being in a higher division (but doing nothing in it) for YEARS. Good god, it's boring. And, finally, we have a right to be excited! But have you seen the first 45 mins of both our last two home games? Blimey! I'm scared senseless that you'll somehow win this one - and with that idiot Andy D'Urso in charge, I wouldn't be surprised if we have another Stamford Bridge 1974 on our hands. First team to win at the Amex? Presumably Tottenham and Liverpool don't count! Er no Tottenham and Liverpool don't count, one was a friendly and one was Carling Cup, it's the league that counts . . .
3-1 and to top it all off Glen Murray scored the winner! Like the self-righteousness comment, Kevin. Went last night. Great result, fully deserved. Only thing that sucked about the evening was the travel. Dumb place to put a stadium.